The intensity of sound propagating from a source in the ocean becomes diminished with range due to geometrical spreading, chemical absorption, and reflection losses from the bottom and surface. Measurements of sound intensity vs. range and depth in the water column may be used to infer the speed of sound, density and attenuation coefficient (geo-alpha) of bottom sediments. Numerous inversion algorithms have been developed to search through physically viable permutations of these parameters and identify the values of these parameters that provide the best fit to measurements. This approach yields valid results in regions where the concentration of swim bladder bearing fish is negligible. In regions where the there are large numbers of swim bladder bearing fish, the effect of attenuation due to fish (bio-alpha) needs to be considered to permit unbiased estimates of geo-acoustic parameters (Diachok and Wales, 2005; Diachok and Wadsworth, 2014). Swim bladder bearing fish resonate at frequencies controlled by the dimensions of their swim bladders. Adult 16 cm long sardines resonate at 1.1 kHz at 12 m depth. Juvenile sardines, being smaller, resonate at higher frequencies. If the number of fish is sufficiently large, sound will be highly attenuated at the resonance frequencies of their swim bladders. To demonstrate the competing effects of bio and geo-alpha on sound attenuation we conducted an interdisciplinary experiment in the Santa Barbara Channel during a month when the concentration of sardines was known to be relatively high. 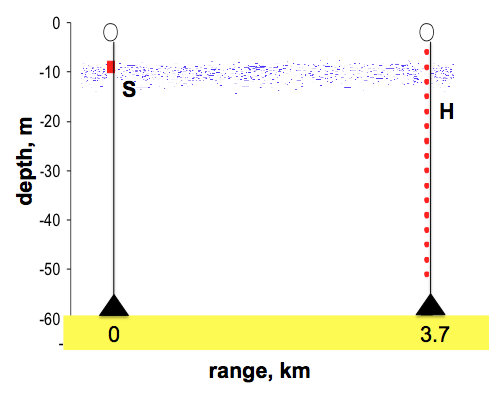 This experiment included an acoustic source, S, which permitted measurements at frequencies between 0.3 and 5 kHz and an array of 16 hydrophones, H, which was deployed 3.7 km from the source, as illustrated in Figure 1. Sound propagating from S to H was attenuated by sediments at the bottom of the ocean (yellow) and a layer of fish at about 12 m depth (blue). To validate inferred geo-acoustic values from the sound intensity vs. depth data, we sampled the bottom with cores and measured sound speed and geo-alpha vs. depth with a near-bottom towed chirp sonar (Turgut et al., 2002). To validate inferred bio-acoustic values, Carla Scalabrin of Ifremer, France measured fish layer depths with an echo sounder, and Paul Smith of the Southwest Fisheries Science Center conducted trawls, which provided length distributions of dominant species. The latter permitted calculation of swim bladder dimensions and resonance frequencies. Figure 2 provides two-hour averaged measurements of excess attenuation coefficients (corrected for geometrical spreading and chemical absorption) vs. frequency and depth at night, when these species are generally dispersed (far apart from each other) near the surface. The absorption bands centered at 1.1, 2.2 and 3.5 kHz corresponded to 16 cm sardines, 10 cm anchovies, and juvenile sardines or anchovies at 12 m respectively. During daytime, sardines generally form schools at greater depths, where they resonate at “bubble cloud” frequencies, which are lower than the resonance frequencies of individuals. 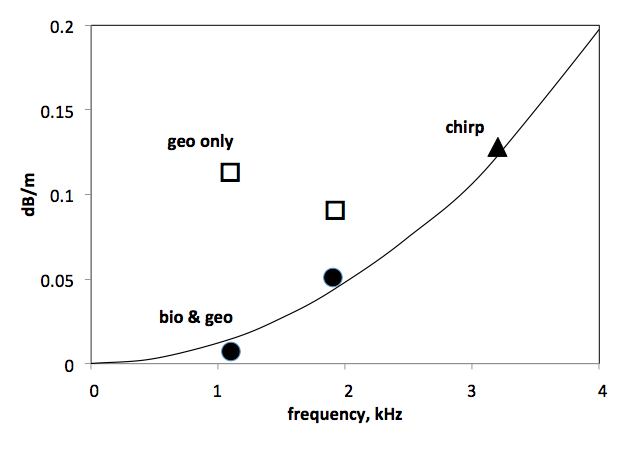 The method of concurrent inversion (Diachok and Wales, 2005) was applied to measurements of sound intensity vs. depth to estimate values of bio-and geo-acoustic parameters. The geo-acoustic search space consisted of the sound speed at the top of the sediments, the gradient in sound speed and geo-alpha. The biological search space consisted of the depth and thickness of the fish layer and bio-alpha within the layer. 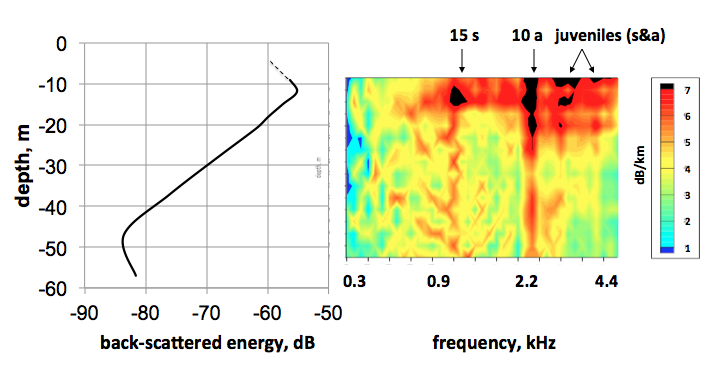 Figure 3 shows the results of the search for the values of geo-alpha that resulted in the best fit between calculations and measurements, 0.1 dB/m at 1.1 kHz and 0.5 dB/m at 1.9 kHz. Also shown are results of chirp sonar estimates of geo-alpha at 3.2 kHz and quadratic fit to the data. If we had assumed that bio-alpha was zero, then the inverted value of geo-alpha would have been 0.12 dB/m at 1.1 kHz, which is about ten times greater than the properly derived estimate, and 0.9 dB/m at 1.9 kHz. These measurements were made at a biological hot spot, which was identified through an echo sounder survey. None of the previously reported experiments, which were designed to permit inversion of geo-acoustic parameters from sound propagation measurements, included echo sounder measurements of fish depth or trawls. Consequently, some of these measurements may have been conducted at sites where the concentration of swim bladder bearing fish may have been significant, and inverted values of geo-acoustic parameters may have been biased by neglect of bio-alpha. Figure 1. Experimental geometry: source, S deployed 9 m below the surface between a float and an anchor, and a vertical array of hydrophones, H, deployed 3.7 km from source. Figure 2. Concurrent echo sounder measurements of energy reflected from fish vs. depth (left), and excess attenuation vs. frequency and depth at night (right). Figure 3. Attenuation coefficient in sediments derived from concurrent inversion of bio and geo parameters, geo only, chirp sonar, and quadratic fit to data. Acknowledgement: This research was supported by the Office of Naval Research Ocean Acoustics Program. Diachok, O. and S. Wales (2005), “Concurrent inversion of bio and geo-acoustic parameters from transmission loss measurements in the Yellow Sea”, J. Acoust. Soc. Am., 117, 1965-1976. Diachok, O. and G. Wadsworth (2014), “Concurrent inversion of bio and geo-acoustic parameters from broadband transmission loss measurements in the Santa Barbara Channel”, J. Acoust. Soc. Am., 135, 2175.